Hyundai is using the Nexo crossover as the host for its fuel cell technology. Hyundai's next-generation fuel cell vehicle, the Nexo, will boost range more than 30 percent over its predecessor and will be built on a dedicated platform. It debuted Monday at CES in Las Vegas. The automaker is using a crossover as the host for its fuel cell technology, just as it did with the Tucson/ix35. Hyundai said the Nexo's estimated driving range is 370 miles (596 km) in the U.S. test cycle, a significant jump from the Tucson's 265 miles. Under the NEDC European test cycle, it range is 500 miles, Hyundai said. 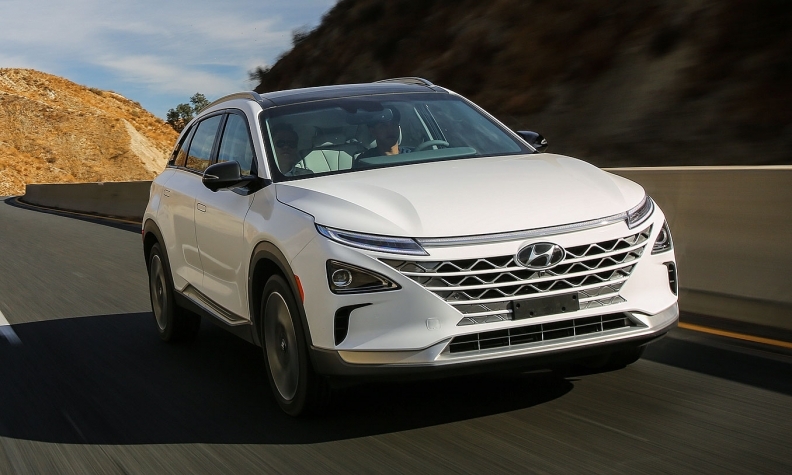 Hyundai says the Nexo will spearhead its plans to "accelerate development of low emission vehicles, in line with Hyundai Motor Group's renewed goal of introducing 18 eco-friendly models to global markets by 2025." The automaker said the crossover will serve as the "technological flagship" of its "growing eco-vehicle portfolio." It will go on sale in selected global markets this year. The Nexo will feature a blind-spot view monitor, which "shows drivers on a center cluster screen the rear and side views of Nexo using cameras while changing lanes in either direction." Other tech includes lane-following assist and highway-driving assist. Lane-following assist, which debuts on the Nexo, automatically adjusts steering to keep the crossover centered in its lane at speeds up to 90 mph. Highway-driving assist, powered by sensors and map data, adjusts speed in limited environments to help drivers more safely travel long distances. The Nexo also boasts remote smart-parking assist, which enables it to "autonomously park or retrieve itself from a parking space with or without a driver in the car." Hyundai says the system can back into a parking spot by itself with a touch of a button from the driver. The Nexo will have the same quiet ride of the Tucson. Hyundai says all of the moving parts are installed within the engine bay, isolating the noise to one area. The crossover's battery was relocated from the undercarriage to the trunk. The new 120-kilowatt motor is a bump up from the Tucson's 100 kw motor. The next-gen vehicle accelerates from 0 to 60 mph in 9.9 seconds, 2.6 seconds quicker than the Tucson. The cold-start temperature is improved on the latest model. It can be fired up in temperatures as low as minus 22 degrees Fahrenheit, which is 18 degrees lower than the Tucson. The new crossover was cold-weather tested in locales such as Alaska and Sweden. To test its cooling performance, Hyundai took the crossover to California's Death Valley, where the temperature reached 127 degrees. The crossover, which has been spotted on public roads, is expected to go on sale in the U.S. this year. 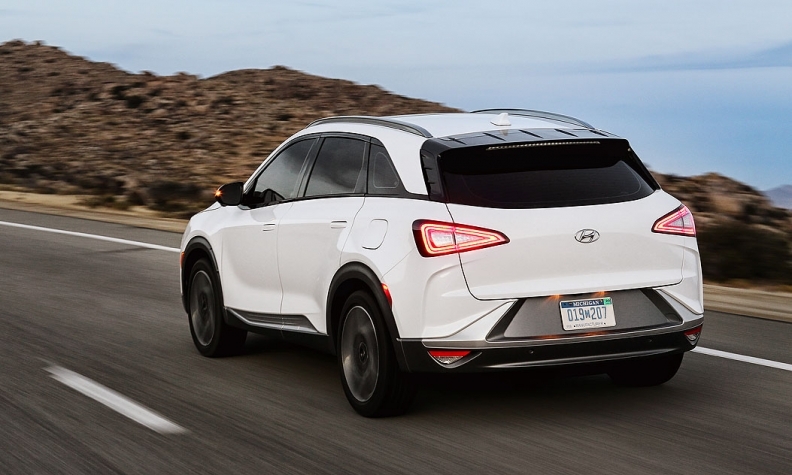 It will be one of eight new or redesigned crossovers Hyundai has planned for the U.S. by 2020. Other models include the new Kona subcompact crossover and an all-electric Kona, a yet-to-be announced A-segment model slotted below the Kona and a larger, eight-passenger model to replace the Santa Fe. Hyundai said last week that the new fuel cell vehicle will feature its latest driver-assistance technology. It also will serve as the next test vehicle for advanced autonomous-driving systems being developed under a new partnership with Aurora, a Silicon Valley self-driving technology company led by Chris Urmson, who led Google's self-driving car project until 2016. Hyundai said the fuel cell system is well-suited to delivering reliable power for the banks of sensors and processors needed for autonomous operation.